Unlike birds and amphibians, mammals can’t recover lost hearing. In people, the cells of the inner ear responsible for detecting sound and transmitting those signals to the brain form during early stages of development and can’t be replaced if lost due to illness, injury or aging. 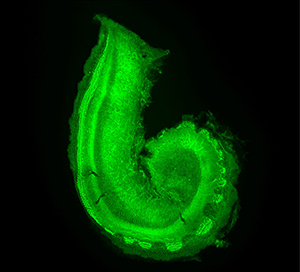 Studying mice, scientists at Washington University School of Medicine in St. Louis have identified two signaling molecules that are required for the proper development of a part of the inner ear called the cochlea. Without both signals, the embryo does not produce enough of the cells that eventually make up the adult cochlea, resulting in a shortened cochlear duct and impaired hearing. 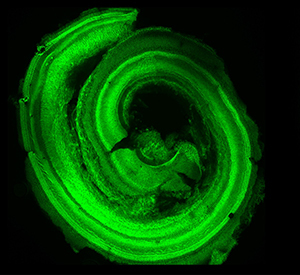 The study, available online in the journal eLife, contributes to the understanding of inner ear development, a first step toward the goal of being able to recover lost hearing. In the new study, Ornitz and his colleagues showed that proper inner ear development in mice depends on the presence of two signaling molecules called FGF9 and FGF20. Normal signaling of these molecules in the inner ear turns on at about day 11 of the mouse embryo’s typical 20-day development. Over the next two to three days, these two molecules direct the progenitor cells to multiply. By embryonic day 14, the progenitor cells stop multiplying and begin to differentiate to become functional adult sensory cells. At this point, the cellular population that comprises the adult ear is largely complete, according to this and other studies. The absence of certain FGF signals during inner ear development results in a shortened cochlea and impaired hearing. The hair cells of the inner ear pick up sound vibrations and transmit those signals to the brain. Hearing loss occurs when these hair cells are damaged, most often by loud noise, some types of medications and the aging process itself. According to the new study, FGF9 and FGF20 send signals to their receptors, which are located in nearby cells that surround the developing sensory cells. Through signaling to these surrounding cells, FGF9 and FGF20 promote the growth of the sensory progenitor cells. This signaling activates a feedback loop that helps to direct proper development of the cochlea. According to Ornitz and Huh, future work is focused on identifying the molecules involved in the feedback mechanism. 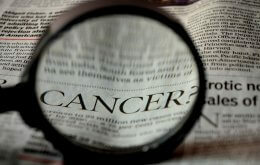 This work was supported by the Action on Hearing Loss Foundation; the Office of Naval Research, grant number N000141211025; the March of Dimes Foundation; the Hearing Health Foundation; and the National Institutes of Health (NIH), grant numbers K99 DC012825, P30 DC004665, P30 DK052574 and P30 AR057235. Huh SH, Warchol ME, Ornitz DM. Cochlear progenitor number is controlled through mesenchymal FGF receptor signaling. eLife. Online April 27, 2015.